Who cares about the 1960s art scene in Århus, Denmark’s second-largest city? Not many, apparently. Århus Rapport 1961–1969,1 a small anthology that documents an astonishing amount of experimental artistic activities, collated and published by the artists themselves in 1969, is yet to be fully historicised.2 ‘Aarhus Rapport – Avantgarde as Network (or, the Politics of the Ultralocal)’, the current exhibition at Kunsthal Aarhus, however, begins to address this omission, taking the book as a point of departure.3 A move that is long overdue, perhaps, considering that what is now called Kunsthal Aarhus was founded on the initiative of Århus Kunstforening af 1847, the art association that published the book. Even more so when you consider the trajectory of self organisation and documentation that the ‘report’ bears witness to: the numerous happenings, actions, environments, poetry readings, new music, exhibitions, interventions and sculptures in public space that took place across the city of Århus during the 1960s. Edited by Kristen Bjørnkjær together with artists Mogens Gissel and William Louis Sørensen, Århus Rapport highlights these ventures and the artists who were bringing new art forms to what was then the largest town in provincial Denmark. The invitation, reproduced in the book, to take part in ‘Actions, exhibition, performance, agitation etc.’, an exhibition organised by Young Art at Århus Kunstbygning in 1969, for example, reads: ‘Everyone can participate; all forms of communication are accepted; all submitted material will be exhibited’.4 Such events, propelled by the arrival of a few artists with connections to elsewhere, saw visits from national as well as international artists – such as Fluxus artist Takehisa Kosugi in 1967 and George Brecht in 1968. In other words, the Århusgarde, as they called themselves, a group of Danish and predominantly male artists (only one woman, artist Kirsten Justesen, is represented in the book), brought about an avant-garde moment in late 1960s Århus. This, the exhibition argues, was because they were plugged into artistic networks. ‘Aarhus Rapport – Avantgarde as Network’ also draws on the artists’ collaborative and self-organised manner of working as a methodology for exhibition-making. The show is the result of a research project initiated by the Kunsthal’s artistic director, Joasia Krysa, and Lars Bang Larsen, who invited curators, artists, academics and an independent publisher to form a curatorial collective to investigate and reinterpret the original material found in Århus Rapport. These in turn invited other participants and collaborators to be involved in the project. Thus almost every room in the 1,000-square-metre exhibition space of the Kunsthal has a curator responsible for it, and each curator has their own list of artists and collaborators, giving the sense that the Kunsthal has allowed the project to grow and unfold on its own; to become self-organised.5 This lapse in institutional control makes for an uneven exhibition narrative, but one that, perhaps despite itself, reveals continuities and discontinuities between past and present concerns. Kølbæk Iversen’s ‘Archive Section’, a riveting cluster in terms of display, seems to flip the subjective organising principle of Århus Rapport and the chronological ordering of events, to ‘include all excavated materials’ and to create a new web of connections. 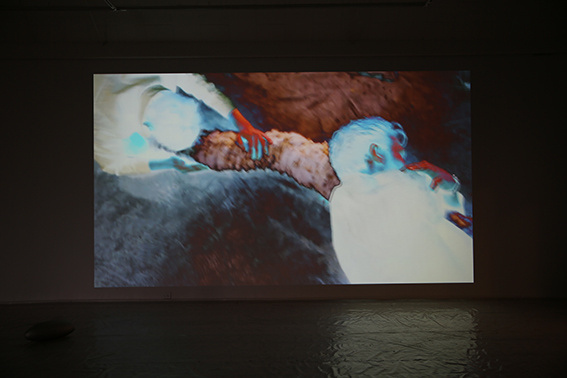 Alongside documentation of exhibitions, performances and events, catalogues, posters and sound recordings, her display includes original artworks that were documented in the book, such as sculptures, paintings and artists’ films. It offers a foundation for the re-scoring of the book elsewhere in the show, and is refreshing in that visitors are allowed to flip though some of the archival images and artists’ personal scrapbooks laid on tables. 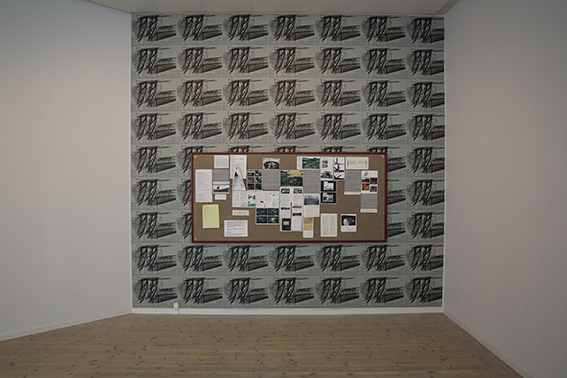 In the next room, as part of the ‘Re-enactment Programme’, a minimal display of other artworks originally documented in Århus Rapport are reactivated through a series of questions posed by Bang Larsen, such as ‘How does a contemporary audience perceive a re-enacted piece?’ and ‘When is it meaningful to re-create art works?’; the programme, apart from dealing with a specific historic moment, also seeks to ask how we can experience these works and engage with this material today. Kirsten Justesen’s FOLD SCULPTURE 1968, 1968/2014, a fold-up paper sculpture with a photograph of a cardboard box with the artist inside on it, for example, is taken, quite literally, from the pages of Århus Rapport and blown up to a near life-size cut-out displayed on the wall. And William Louis Sørensen’s Rød prik: By-environment (Red dot: City Environment, 1968/2014), a red dot on small pieces of paper, originally produced as an insert in Århus Rapport, and a recurring motif in the artist’s work from the 1960s, is presented on a low pedestal on the floor. (It has also been adapted as the graphic identity of the exhibition.) At its best the synergy between the ‘Archive Section’ and the ‘Re-enactment Programme’ makes for an intricate comparison between original, documented and re-created and allows one to imagine two different times simultaneously. this imported concept attempts to overturn the charge of unsophisticated provincialism but does little more than underscore the exhibition’s argument that Århus was at the forefront of the Danish avant-garde scene of the 1960s. Although suggesting a similar coming together – here of the particular and the general – the wall text centrally placed in the foyer: ‘“Aller a l’universel par l’ultralocal/ Only from the ultralocal can one arrive at the universal” Michel de Montaigne according to Salvador Dali’, seems like an afterthought. Unlikely to be a reference point for the artists active around Århus in the 1960s, this imported concept attempts to overturn the charge of unsophisticated provincialism but does little more than underscore the exhibition’s argument that Århus was at the forefront of the Danish avant-garde scene of the 1960s. As Bang Larsen explains in the introduction to the accompanying seminar ‘Avantgarde as Network’: ‘The term ultralocal, as opposed to provincialism, presents a neutrality of value, and displaces the notions of avant-garde centres and peripheries. In fact, one could say, there are ultralocals in both centres and peripheries.’9 This skewing of centre / periphery dichotomies is also an attempt to reconfigure both the decentred writing of art history undertaken by the editors of Århus Rapport and an endeavour on the part of the Kunsthal itself, following the lead of the connectedness of the local 1960s artists, to re-plug into the circuits of the current (art) network.10 The second part of the exhibition title ‘(Or, The Politics of the Ultralocal)’ seems to find a deeper resonance in the contemporary artists’ responses to Århus Rapport. For most of these are spun from engagements with ‘ultralocal’ sites that are not Århus but various rural areas in Denmark, China and the US, exploring forms of self-organised communities and alternative social models. Antipyrine, for instance, set up camp at Sønderholm farm, north of Århus, in order to explore a variety of themes around rurality, urbanism to utopia, which resulted in the exhibition and seminar ‘Inquiries in earth and art’, made in collaboration with the community living on the farm. This exhibition, curated by Antipyrine/Sønderholm, was installed in the basement of the Kunsthal and includes remnants of the project – a pin board shows scraps of papers, photographs and newspaper clippings that tell the story of the farm, juxtaposed with texts on ‘Ruralitet–Urbanitet’, the anthropocene11 and a short story by Lydia Davis, alongside works by artists. Chinese artist Ou Ning’s notebook and documentary film Bishan Commune: How to Start Your Own Utopia (2010) tell the story of his utopian project started in a Chinese village in 2011, where he now also lives. This critical response to the super-urbanisation and industrialisation of agriculture in China, and its resulting depopulation of rural areas, is shown next to other reconnections with the soil, such as a series of photographs titled Jordarbejder (Efter Smithson) (Earthworker (After Smithson), 2014) by Lasse Krog Møller, which documents miniature spiral jetties made in pools of mud and plays on the notion of working with the earth as an aesthetic rather than agricultural practice. 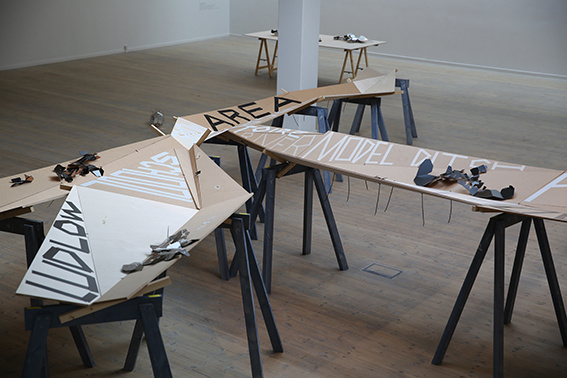 The neighbouring work, Working Model (2014) by Hullfish Bailey, also makes reference to a community of artists who have relocated from the urban to the rural landscape. Taking up the majority of the basement space with a three-armed MDF-structure that resembles a geographical model, and several other three-dimensional models with photographs, text and accordion-folded maps placed on tables and pallets, this work is Hullfish Bailey’s extensive reimagining and idiosyncratic mapping of Drop City, a late 1960s experiment in rural Colorado by young American artists who sought to create a total live-in artwork. This mapping-out of a distant locale might only tangentially tie into the avant-garde influences of 1960s Århus, but his methodology of subjective enquiry and selection mirrors that of Århus Rapport. The presentation of these new works under the banner of the ‘Avantgarde as Network’ raise questions of how applicable the concept of the avant-garde is to today’s practices.12 If avant-gardism implies a rebellion against established forms in order to secure a new social order of progress, or to attack the establishment of art, this propels a linear trajectory. Whereas this kind of contemporary artistic practice – instead of severing bonds with the past – actively tries to establish them so as to reinvigorate their promise of the new and resistance to a capitalist (art) world. A vibrant piece of Danish art history unfolds from within the pages of Århus Rapport, revealing trajectories both linked to the city of Århus in particular and the city in general as a site with potential for experiments.15 By contrast, the string of newly commissioned works pulls the exhibition narrative to an almost antithetical position that presents the retreat of artists and communities to rural settings in order to experiment with art and alternative social models. In this juxtaposition it seems poignant that the contemporary works, rather than experimenting with new forms of art as was the case for those artists active in 1960s Århus, attempt to tackle urgent (non-art) questions regarding how ‘we organise ourselves in the world’ and touch on topics such as environmentalism and urbanism. Whilst the Århusgarde were experimental, they were not (yet) politicised in their actions. Connecting with the past in order to re-approach the future might seem an attractive alternative to the current landscape, deplete of any new social visions beyond global capitalism. 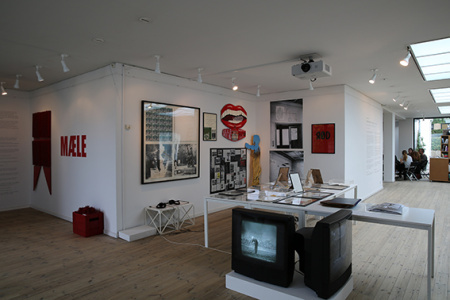 ‘Aarhus Rapport – Avantgarde as Network’ is at once a historical exhibition, a research exhibition, a collaborative exhibition and an exhibition of contemporary art, and it is also an exhibition within an exhibition from within a series of exhibitions.16 If principles of inclusivity and collaboration shine through, however, it is in the strategies employed rather than in the content of the works. This approach, with its broad definition of network (as both pre and post-digital), avant-garde (historical and current) and ultralocal (peripheral and central), results in an exhibition that is more of a container, gathering all that results, than a curated argument. ‘The Avantgarde as Network’ suggests a curious reconfiguration of the temporal logic of the avant-garde, with its negation of past forms and contract with the future, through a coming together of different temporalities. Indeed one might not think of time as chronological, as the linear form of Århus Rapport does, but the space, the exhibition, as a coming together of different times, different forms of presences and different manifestations of temporality. Connecting with the past in order to re-approach the future might seem an attractive alternative to the current landscape, deplete of any new social visions beyond global capitalism. Such a methodology risks nostalgia yet might spur the reimagining of time to come. Something is certainly sprouting from the ‘avant-gardish notions’ underneath the transparent polyethylene plastic in Porsager’s installation, only it is too soon to say exactly what. Meanwhile, to the rhythm of ‘Ahhh’ and ‘O Luminous Annulus’ the ants go marching on.